Your request is sent as an email to the registered contact with us at Freeman Technology Ltd.
Freeman Technology provides systems that measure powder flow properties, underpinning process and product understanding, supporting the optimisation of powder processes. The FT4 Powder Rheometer uses patented dynamic methodology, a fully automated shear cell and several bulk property tests, including density, compressibility and permeability, to quantify powder properties in terms of flow and processability. Systems are installed around the world in the chemical, pharmaceutical, toners, foods, powder coatings, metals, ceramics, cosmetics, and many other, industries. They deliver data that maximise process and product understanding, accelerating R&D and formulation towards successful commercialisation, and supporting the long term optimisation of powder processes. 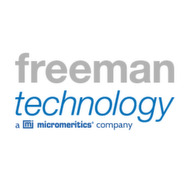 Freeman Technology was founded in 1989 as a developer of automated testing systems for materials characterisation, and has focused exclusively on powders since the late 1990s. The company’s R&D, manufacturing and commercial headquarters are in Gloucestershire, UK, with operations in the USA and China, and distribution partners in Brazil, France, India, Ireland, Japan, Malaysia, Singapore, Taiwan and Thailand.